We have recently turned our traditional holiday house into a comfortable and spacious eco-home, with air-source heat-pump, solar thermal panels and underfloor heating in public spaces and 2 of the 4 bedrooms. We have been coming here for many years. It is a perfect venue and location for meditation. We love all the trees, and the continued planting of new ones, and all the wonderful little birds that live there. Lerigoligan is a special place to share a holiday with friends. Stunning house with wonderful views. 4th visit to Lerigoligan. As always the house and setting were enjoyed by all our friends. The sun shone for us in November which added to our enjoyment. Walks from the door and coming back to the comfort of Lerigoligan, watching the sun go down from the sun room, with tea and cake in hand, was magical to share with old friends. Happy times. Another wonderful weekend at Lerigoligan with family and friends enjoying the cosy house and the beautiful views. Great to have rooms where we could all be together but also to spread out with things happening in the different spaces. Will treasure some new memories made with my baby granddaughter. Lerigoligan is a home from home that we have been visiting for 11 years. It it so well equipped with everything you will need for your stay, We don't tire of this charming house which has one of the best views in Scotland and there is something to do in the local area for everyone and, if you want to get away from it all, this is the perfect location to be active or just relax. There is just something magical about the place and you will fall in love with after your first visit. Beautiful house with wonderful views. I have just returned from the most wonderful two week stay at Lerigoligan with my extended family. The house is really well built and everything in it is really good quality - including incredibly comfortable beds and proper showers. There is excellent sound proofing throughout which was much appreciated as there were four young children in our group and lots of adults that needed to catch up on sleep! The kitchen is really well equipped and there is plenty of crockery and cutlery which was great for a big group. The area is beautiful and the views from the house are stunning - and there is the most perfect swimming spot just a few minutes from the house which was my idea of heaven! This was our second time at Lerigoligan and it did not disappoint. The house is so comfortable, very spacious and spotlessly clean. Views from the house across the loch are beautiful. It's the perfect spot for a relaxing few days. Our stay wàs as usual fantastic great house and fab scenery its is very relaxing we can throughly recommend it. We booked Lerigoligan for a family get together - with some heading south from Sutherland, some north from Hampshire. The house was just perfect for us all (10 max with 2 in the bothy a couple of nights) - big spaces for group meals & lounge we could all fit in, and smaller sun rooms as required to relax. Everything in the house was great quality, the underfloor heating kept us warm, and the views from the sun rooms fantastic. A great early easter holiday..
we all had an excellent stay over the Christmas break. The place is very well equipped including providing binoculars to see the incredible view across the Loch. The Bothy also provides an excellent overflow space and keeps more noisey activity away from the house . Mrs Stewart is also a great asset and makes the stay even more memorable. The view across the loch when you open the curtains in the morning is breathtaking, what a way to start the day. Lerigoligan is beautiful, peaceful, warm and cosy. I have thoroughly enjoyed staying here. We have had meditation retreats at Lerigoligan for many years. We cannot imagine a more ideal place for us. The property was excellent. Beautifully clean and warm and fitted out to a high standard. The only was that we were not made aware that the access was up a very rough and steep track. In snow or ice one would need a four wheel drive to get to the property. It is true, Peter, that the track is steep and rough. We will warn future guests more clearly. However, it is the case that coastal Argyll has very little frost and ice. The last time the track was impassible for more than a few hours was over 30 years ago. Our neighbours are keen not to do it up as it discourages non-residents from using it! What a special place to spend a Winter's break with friends. Warm and cosy with space and comfort. This was a 3rd visit to Lerigoligan. Just as special in the Winter. The underfloor heating and open fire made for a cosy time. A great place to spend time with friends away from it all with space to relax with stunning views. Lerigoligan provided a special week for us all. Thanks again. It's well worth the drive up the very rough steep track to reach Lerigoligan - the views once you get there are amazing! The house is spotlessly clean, cosy and comfortable, and very well appointed - everything you might need is provided, including binoculars to sit and gaze at all the activity on the loch. A good location with a village shop and pub within walking distance and lots of interesting places to visit nearby. We definitely hope to return next year. A lovely cottage - highly recommended! Had the best week staying here with my family. Beautiful location, extremely comfortable & amazing appliances! Very friendly service. This was a base for Argyllshire exploration. The house is very comfortable and the outlook is superb. Ever changing views with the weather. Excellent kitchen. Recommend the little shop. Local vegetables and produce. Will recommend to any friends coming to Scotland. The house is large and spacious and very welcoming. Booking and arrival was well explained and directions were great. The house was immaculate and really well equipped. There was enough of everything for a large party of people and kids and adults alike really enjoyed the stay. We wanted somewhere where we could relax, go for walks, eat out and this place had it all. The village is sweet and has a good pub serving food and a really well stocked shop. The lochs were lovey for swimming ( a bit cold!) and there is lots to do in the area. We've already re booked for next year and that is really rare for us to go somewhere twice. What a great place! As our student grandson said "The view alone imust be worth £100,000!" Although the track up to Lerigoligan is rather rough, the cottage itself is warm and comfortable, and very well equipped. We also made good use of the Bothy and greatly enjoyed the table-tennis facility. The surrounding countryside is really beautiful, with a great diversity of wildlife. Masses of birds used the feeders in the garden, but our highlight was the Three IslandsTour from Oban - Mull, Iona and Staffa. On Staffa we were literally surrounded by puffins, so tame you could almost touch them, We needed more than a week at Lerigoligan so perhaps we can come again in the not too distant future. It's fantastic location and views are stunning great place to relax and recharge great walks for the dogs. We loved our time in this wonderful space. It is intelligently laid out, uplifting to be in and the views are transfixing. What a find. Lerigoligan provided the ideal setting for us to have a fantastic time, with space for dancing as well as quieter spaces. The house is fabulous, and Dawn and Jan (the housekeepers) made us feel at home. Only the location should be rated as good, as it is was further from activities than expected. Would we return? Most definitely. what a house and what a view! Incredible spot, Ardfern is a lovely spot we did quite a lot of walking from the house with several routes to explore from the front door! The owner had made several easy to use maps that guided us around the area. The House and 'Bothy' are excellent. Spacious and thoughtfully laid out more than enough space for our multi generational group. Would highly recommend the food as well, we arrived very late and had arranged through the owners to have a meal ready to cook when we arrived. Looking forward to heading back to Ardfern next spring! We were there for meditation. Absolutely ideal. The Glasgow Zen Group www.glasgowzen.com have been going to Lerigoligan twice a year for our meditation Retreats, and it is absolutely perfect for us: clean, comfortable, quiet, beautiful location, wonderful trees and vibrant bird life. We also walk in the surrounding countryside, which is virtually deserted most of the time, other than for sheep and highland cattle.. On a good day from the top of the hill above the house, we can see Jura. Very conveniently located well stocked local shop nearby. The venue was an inspiring setting for a small group retreat - quiet and beautiful. The care that has gone into the creation and upkeep of the property feeds into the meditation. There are many small places for people to sit, journal and breathe in the expansive landscape. 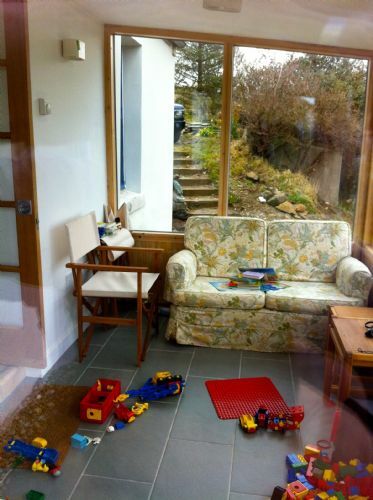 Lerigoligan is even better than the pictures - its a beautiful cottage, and we could easily have spent our whole week looking at the amazing view of the sea loch from the sun room. Its warm, very spacious and really comfortable, furnished with an elegant simplicity. But there is plenty to do in the local area so its a great base for a winter holiday. There are lovely walks from the door, small islands to explore, prehistoric remains and attractions around Oban - plus great places to eat. We will definitely be coming back. Wonderful to be back in Lerigoligan ... one of our favourite places in Scotland. Waking up to the stunning view from our bedroom is special. The house is so warm and comfortable with plenty of space for us all. The peaceful surroundings and the natural daylight everywhere within the house makes for a very relaxing atmosphere. We had a number of lovely walks interspersed with just the right amount of lazing about and visits to the Crafty Kithchen. 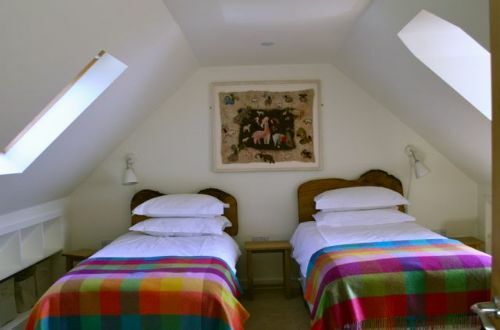 Wonderfully appointed accomodation at a very reasonable cost.Location was fabulous for lazy days enjoying the view and for going out and about ,discovering the history and countryside. Would highly recommend. Another fabulous stay at Lerigoligan. Our music group loves it here, so inspirational in terms of location and facilities to mean even a larger group is easily accomodated... including those who want to run on the hills, escape to Oban for a morning or wander down to the pub. Just such a fabulous finish to the whole house, it's warm and welcoming and a joy to borrow for the all too short days! Thanks all for lovely stay. We are becoming accustome to the workings of the induction hob and cooker even!! Lerigoligan - the most wonderful holiday home. Lerigoligan is maintained to a very high standard. Our friends who have visited us on holiday are quite overwhelmed by its situation and our New Zealand friends who came for two days couldn't believe the views from the house - they are breathtaking. It is very much home from home and there is everything in the house that you will need to enjoy your stay. There is much to do in the local area with lots of interesting walks that can be accessed from the house. We have been visiting Lerigoligan for 10 years and never tire of it - it's how we get our "Scottish" fix. Having had a wonderful stay at Lerigoligan 7 years ago we were looking forward to returning this summer. The renovations that have been done to the house are excellent and the bedrooms with the loch views a real 'wow' feature. Rarely have we stayed anywhere which has been so comfortable - every aspect thoughtfully and well equipped. We made the most of the housekeeper's catering expertise and very much enjoyed the three meals that she prepared for us during our stay. The 'bothy' was a very welcome addition with it's table tennis and extra space. We had a fantastic week, the sun shone, and the views from the garden just stunning. Many thanks for sharing this special property. What a view! On our second visit on arrival we all repeated the little word 'wow'. Returning to Lerigoligan this summer gave our family gathering much pleasure. Big sighs, smiles and comments of "it's so good to be back". On arrival first it was the breathtaking views, a huge 3 masted yacht included and then the Lerigoligan comfort experience. The house has everything you could possibly need although it took us 2 days before we found the toast rack! Lerigoligan is definitely a place for relaxation, great walks and stunning views. It is now a special family place for us, to which we will return, from the young to the elder members. A superb house in a wonderful location! The house is perfect located above Ardfern at a wonderful loch with great view over the local yacht habour. The village of Ardfern is small but very charming with a nice cafe and a local shop where you can get anything. This is a wonderful house, in a stunning location. The house is beautifully designed and well-equipped, with everything of high quality, but without blingy ostentation! We loved it! I knew that we were going to a really stunning place and everything was perfect - from the cleanliness, the showers, the rooms, the views to die for and the whole atmosphere. Thank you so much. We loved it just as much as I knew we would. We have stayed in lots of holiday cottages around Scotland and indeed the rest of Europe and North America, and this really was the nicest one we have been lucky enough to find. Amazing views, top quality accommodation, absolutely everything you could need - I've never felt more at home on holiday. The only negative we had was that we had to leave a day early and travel home overnight due to heavy snow forecast. Good job we did as I am now sat at home 350 miles away with 8 inches of snow at my door and I believe it's beautiful sunshine in Ardfern! We had a great five nights at Lerigoligan. The house is beautiful, very luxurious and the view is stunning. 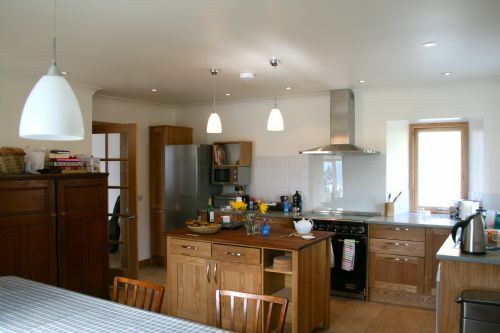 The kitchen is huge, very well organised and really well equipped. Lovely to have a big log fire in the evening. Big comfy bed with patio doors onto the amazing view. Sat outside eating breakfast in a vest a couple of mornings (at the end of October!!). The surrounding area is stunning too. Hope we can go back sometime! So well thought out to be very comfy and welcoming ,with beautiful views to qa stunning landscape . Lerigoligan has been designed and is kept to be a very easy place to stay in tasteful comfortable well-considered surroundings ,with both cosy and open spaces.The house and kitchen are very well equipped. immaculately kept,warm and welcoming -the two bedrooms with views over the Ardfern boats ,the peninsular and on a good day out to Jura are spectacular as is the light glass link dining room which also enjoys these views.. and that is all before you go outside ... If you haven't been to Ardfern already look it up on the map and go and see for yourself! As always, it was so good to be back at Lerigoligan; it is the most wonderful house and always exceeds expectations. The accommodation and equipment are 5 star, there is absolutely everything in the house that you will need to enjoy your holiday. We had a very busy and relaxing three weeks, and was able to share our holiday with family and friends who were overwhelmed by Lerigoligan and the incredible scenery. As one of our guests said "This has to be one of the most beautiful places I've visited, and the best equipped holiday house I have ever visited. It is very much home from home." As mature visitors to Lerigoligan with ages ranging from 50 to 82 years young we much appreciated the fabulous comforts, superb layout and well equipped kitchen, as well as the beautifully appointed bathrooms. Most of all the new addition of the 'West Wing' and easy access through the entrance for the elderly disabled member of our party was much appreciated. The easy access added to their independence and ability to relax.The location of Lerigoligan is superb, the views are stunning, the immediate walks are wonderful and the close proximity of the village amenities means you barely need to drive out of the village. If I had to make one criticism it would be that we found the living room chairs too soft but that might be down to our mature ages!! We plan to book again for next year. This is a "Top 10" facility. We loved it! Our stay was perfect in every way. The cottage is superb and the location is incredible. The ambience is warm, inviting and cosy. a truly wonderful stay. the house itself is beautiful, with incredible views. Set up fantastically for a group to be all together and separate as desired.. Lots of ping pong and fires when the weather isn't great, but most of the time out and about in the beautiful local area. Great walking, wildlife and boat trips. Seafood straight off the boat, lovely local produce and a little whisky! I could not recommend it highly enough. We had a wonderful time! We have stayed at holiday homes before but never in such a well-equipped, clean and spacious home as this one. And the view... we were completely blown away (that would include the literal meaning, when we climbed to the top of the hill where we could also see the valley on the other side). We spent hours watching the birds from the sun room (bird feed provided for) and the ever changing skies. Just one criticism: we felt the photographs of Lerigoligan on the website really don't do the place justice. Look at these photo's and multiply by ten. You'll be happy you chose this place when you arrive! I cannot imagine a better place to hold a meditation Retreat. The landscape is magnificent and inspiring, the grounds are beautiful and full of playful little signing birds. For the second year in a row we spent Christmas week at Lerigoligan. The house was as beautiful as we remembered. What we love about it - the lovely warm and comfortable bedrooms and especially the very good beds, the elegant bathrooms (a rare treat in Scotland), the sitting room with the log fire and the mid century furniture, the big farmhouse kitchen with its great long table perfect for family breakfast on Christmas morning and for our murder mystery dinner on Boxing Day, the utility room with the extra fridge for storing our bottles of prosecco, and most of all? - the beautiful view of the the loch down below and the hillside across the water, the hills and the sky. If we ever get there in summer we'll enjoy the little sun room and the link dining room. Everything clean and warm and waiting for us. The perfect place for a relaxed family break. This was our second stay at Lerigoligan. The house is amazing - very comfortable, well equipped and in a beautiful location with stunning hilltop views over the water. Once again fabulous stay at "Leri" for our folk music weekend - amazingly well appointed, warm, comfortable, eco-friendly, wonderful views from almost all the rooms, and with log fire and fabulous kitchen and bathrooms and good beds and bedding, it's everyone's dream home! I love the bendy wall in the last bedroom/bathroom. Ardfern is a bit off the beaten track (2hr45m drive from Glasgow) - but so worth it when you get there! Geraldine. Every aspect of this gorgeous house shows that the owners care deeply about the property, the surrounding environment and the comfort and pleasure of their guests. Everything that a guest could wish for has been thought about and the whole house has been recently renovated and rebuilt to the highest standard and in beautiful taste. "Stunning views" has become a cliché in holiday reviews but this time it's true! Sweeping vistas of sea, hillside and mountain greet you from every window. The situation of the house is completely private yet only minutes from an interesting, bustling village full of amenities. You could not fail to have a peaceful yet stimulating stay in this beautiful house where every need and pleasure has been catered for. Well done the owners and thanks! 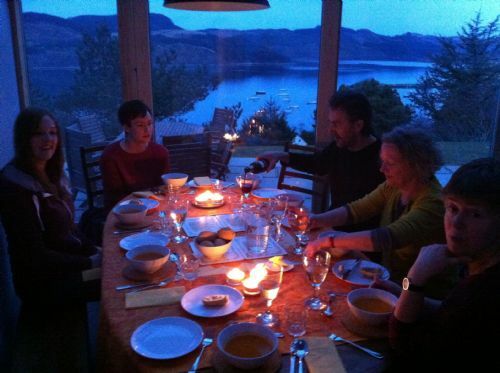 We always look forward to returning to Lerigoligan; it's quite the most delightful home with spectacular views down over Loch Craignish The house has everything you need - very much home from home. The area is stunning with lots to do: sailing walking, and chilling out! We can't wait to return. A beautiful renovated house (to the highest standard) in a stunning location.. 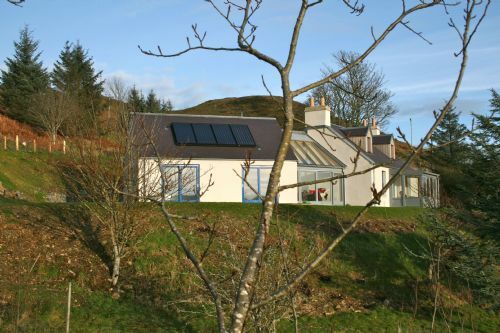 This is a truly beautiful house which has a wonderful view of the Craignish coastline, taking in small islands and, if you're lucky, gorgeous sunsets. The interior has been renovated with quality and lovely simplicity, yet with everything and more you could possibly need. Highly recommended. We had a great stay at Lerigoligan. The house is beautifully situated with incredible views, and is very clean and comfortable. And we were lucky enough to have amazingly warm and sunny weather for our stay (especially for April), which made it all the more enjoyable! The house is amazing. It is spacious, comfortable, very well equipped and maintained, and has stunning views. It is set in a beautiful, peaceful garden. This is one of those few houses that when you arrive you can't believe how well you have chosen and how you never thought it would be as good as it is. The location is so special that, if you can pull yourself away from the view from the house, one way you can wander down a steepish hill and walk along the single track road on the lochside to the shop and pub while in the other direction be immediately on your own amongst the heather and hills looking over craignish and out to jura. The house has loads of space and the kitchen better equipped than mine at home. So if you're thinking of going to that part of the west coast this is the house to go for... it's even away from street lights so the stars are special too.. I spent Christmas at Lerigoligan with my three children who range in age from 14 to 22, so fussy types, of course. 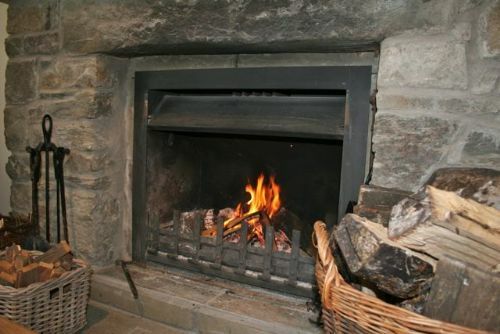 It was really magical - roaring fires, cosy rooms, a fabulous well equipped kitchen. We had five relaxed and happy days, enjoyed cooking good meals, tv, long walks - and the excellent facilities for drying out afterwards! We loved it and would recommend it. This is a really lovely house in immaculate condition and with plenty of room for the whole family. It is remote and a bit tricky to find in the dark but the views in the daylight are wonderful and well worth it. Weekend let for our music group, in autumn/winter from this fabulous home - recently refurbished and extended to a very high spec for both comfort and eco-technologies to be kind to the environment as well. Plenty space, to say is well-appointed is an understatement. East wing for snorers, west wing for sleepers! The location perfect for us, as we know it as a get-away-from-it-all place. You really need a car to get here. The light constantly changing over the water and the hills beyond. Came back calmer of mind. Our 2 families had a fantastic break at the gorgeous Lerigolgan at Ardfern. The views were amazing and I have never been in such a well equipped holiday house. All family members, old and young, had a great time watching the sunrises and sunsets over the sea loch from the house - quite breathtaking!! The village of Ardfern was very friendly and we particularly enjoyed our meal at The Galley of Lorne and our walk from the house over the hill to Croabh Haven and back. Lerigoligan is the most wonderful home in Ardfern, with views overlooking the village and Craignish Peninsula leading to Jura and beyond. The view is just incredibe and has to one of the best views in Scotland. It is lovely to sit in the conservatory and watch the yachts sailing out of the marina. It is very much a family home with excellent accommodation, well equipped for a large family. This has been our first visit since Lerigoligan has been extended and updated, and it really has the wow factor. We can't wait to return again next year. There is lots to do in the area, from sailing and walking to mountain biking - it has something for everyone.